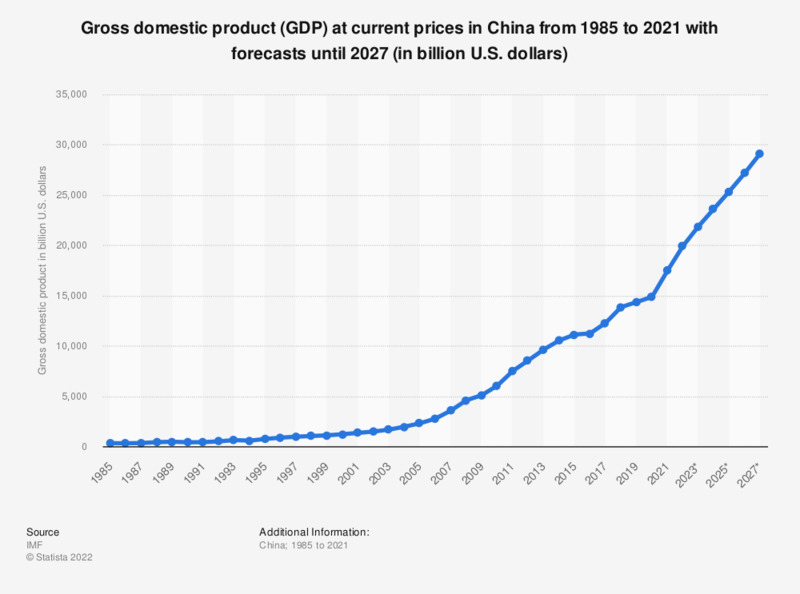 The graph shows China's gross domestic product (GDP) until 2017, with IMF forecasts until 2023. In 2017, GDP in China was around 12 trillion U.S. dollars. That particular year, per capita GDP in China had reached about 8,643 U.S. dollars. In comparison to the GDP of the other BRIC countries India, Russia and Brazil, China came first that year and second in the world GDP ranking. See the Russian GDP for comparison. Gross domestic product (GDP) is a primary economic indicator. It measures the total value of all goods and services produced in an economy over a certain time period. According to the projections at hand, the Chinese economy will maintain a steady growth momentum. Even though the growth rate of China’s real GDP was expected to slow down from 2010, year-on-year GDP growth is still forecast to reach an impressive 6.5 percent by 2019. Since 2010, China has been the world’s second-largest economy, surpassing Japan. China’s emergence in the world’s economy has a lot to do with its status as the ‘world’s factory’. In 2013, China was the largest export country in the world. Some argue that it is partly due to the undervalued Chinese currency. The Big Mac Index, a simplified and informal way to measure the purchasing power parity between different currencies, indicates that the Chinese currency yuan was undervalued by 41 percent in January 2014. Although the impressive economic development in China has led millions of people out of poverty, China is still not in the league of industrialized countries on the per capita basis. To name one example, the U.S. per capita economic output was seven times as large as China in 2014. Meanwhile, the Chinese society faces increased income disparities. The Gini coefficient of China, a widely used indicator of economic inequality, has been larger than 0.45 over the last decade, whereas 0.40 is the warning level for social unrest. Which one of the following countries do you think is the leading economic power in the world today?